Having a multitude of techniques to cope with surviving stress is essential for daily life. Stress can become a bigger problem if you don’t have the tools to deal with it. It can contribute to high blood pressure, digestion problems, sleep issues and may even add to belly fat for some people. Here are a few more techniques that are simple for you to use. 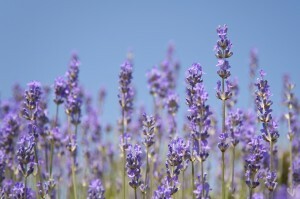 Many of you may already know lavender is wonderful for calming the nerves. Some of the other scents that are also soothing are ylang, ylang, sweet orange and lemongrass. These can actually calm your nerves instantly by inhaling the aromas from these oils. Put a drop of lavender on your fingertips and massage your temples for a tension headache. It feels very soothing. Try adding a few drops of one of these essential oils to an unscented candle and light it. They smell heavenly and will calm your spirit in a short time. Many years ago I was doing psychotherapy in a warm water pool. The effects were amazing. Hydrotherapy has been used for many years as a healing tool, as well as having restorative abilities. To add to your bath time and for surrendering stress, I suggest using bath salts, low lights or candle light, with special relaxing music and even light a healing or aromatherapy candle for added effect. Use any slow, deep breathing techniques and imagine the most calming peaceful place for you. It might be lying on a beach during a warm afternoon, listening to the seagulls and the gentle waves, and picturing on each outbreath as the waves moving out, the tension leaving your body. Or you might prefer imagining the mountains, and listening to the birds and a nearby river, as you smell pine trees with a gentle wind. Use any peaceful inner vacation area that works for you and brings you peace, relaxation and perhaps, even joy! Stress can create serious aches and pains in the body. Sometimes it helps to apply pressure to certain meridian points on the body. I learned these from a reflexologist and from energy Medicine. The energy channels may get blocked from stress or anxiety and this can cause pain or even illness. There are several points I especially like using to alleviate stress. Hold each of the points with the index and middle finger for 30 seconds. The first point is on the little finger side of the forearm at the wrist. Do it on both wrists. It releases headaches, stress and anxiety. The second one is the third eye point between the eyebrows, where the bridge of the nose is indented. It actually calms the body and relieves that anxious feeling. The third point I like to use is in the center of the breastbone. It also calms tension and other emotional imbalances. I find the 3 points work well together when you take the time. Learn more about our complementary upcoming Stress and Anxiety Group Healing Call here.